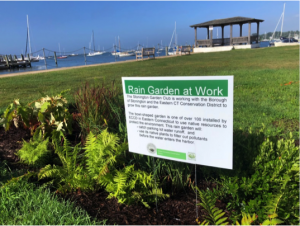 The Stonington Garden Club, Stonington Borough, and the Eastern Connecticut Conservation District (ECCD) have partnered to install a rain garden at Wayland’s Wharf in Stonington Borough. Planted with attractive grasses, ferns, and flowering Oakleaf Hydrangea and Blue Flag iris, this project is funded by the Stonington Garden Club and a Long Island Futures Fund grant. This project is also supported by the federal EPA and the Federal Department of Fish and Wildlife. Located in the middle of the west side of the Borough overlooking the harbor, Wayland’s Wharf’s bowl-shaped garden is nature’s water filter, planted with attractive low maintenance native plants and grasses. It collects stormwater runoff from the parking lot and naturally filters out pollutants, preventing harmful elements from flowing into Stonington Harbor. 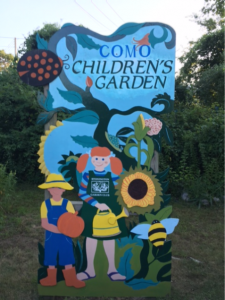 In 1997 the Stonington Garden Club, in conjunction with the Stonington Community Center (“COMO”), joined together to create a community garden that the students (ages 5-15) could visit and enjoy. The curriculum created by COMO staff integrated the different stages of growth in the garden. Complete with raised beds, inclusive of perennials, annuals and full array of vegetables the class programs have flourished. In 2018 the Children’s Garden Committee undertook several fundraising activities in order to renovate the garden. As the curriculum has changed, so should the garden. Our plan will include 11 raised vegetable and flower beds. There is a lovely, small, quaint pond and seating area directly across the street from the COMO. A donated garden shed houses materials and tools. In the back of the garden, a shaded pergola with picnic tables is a favorite student spot. This was donated by the local Stonington Boy Scouts. Over the years, the garden has grown and become an integral part of the COMO’s curriculum. Traditionally, each Spring, the Children’s Garden Committee plans the spring and summer garden (inclusive of growing some plants by seed). New plants are sown and seeds from the prior year’s garden are cultivated as well. The garden is more than an educational tool or a peaceful place to relax; this garden is only one way the COMO has rooted itself as a part of the community. Funding for a new garden at the entrance of Dean’s Mill School. Contribution to Scholarship Fund for GCA Student Conservation Scholarship. 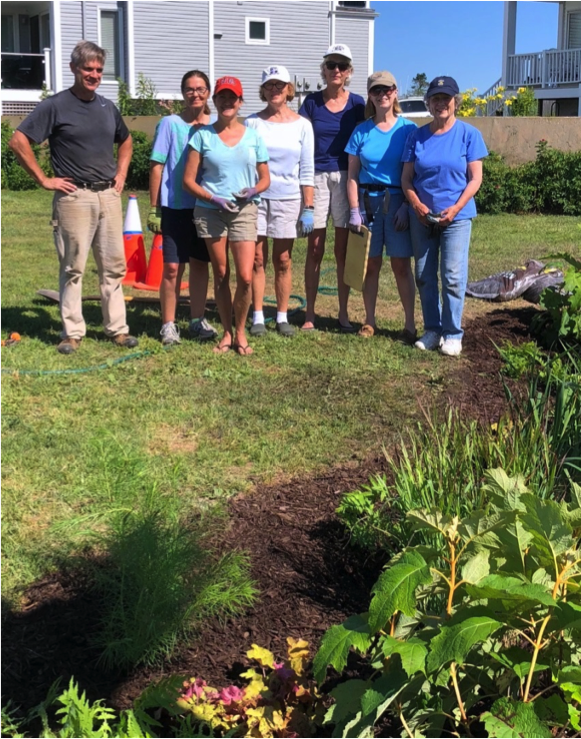 Volunteers from the Stonington Garden Club help to maintain an elegant perennial garden at the Stonington Historical Society’s Lighthouse Museum. In 2016 SGC member Marguerite Moore provided the funds to have the garden replanted with a variety of perennials to provide color and flowers throughout the summer season. Stonington Garden Club makes an annual donation to the Historical Society to help pay for the maintenance of the garden by a professional gardener who works with the volunteers and provides advice. Please stop by the lighthouse, visit and stroll the grounds.